Following brief forays into selling personal indemnity insurance (a job as dull as it sounds) and teaching English in Tokyo (if you meet a Japanese person with indecipherable English, I probably taught them), I began my professional wine career working in the London office of a Japanese importer. I admit to fibbing my way into the position, feigning interest in wine even though I cared little about it beyond its intoxicating attributes. My vinous passion blossomed a few months into the job when I realized that a vocation revolving around fine wine was unlikely to be bettered. In 2006 I quit that job to write full time; however, I keep in touch with my Tokyo colleagues and meet up with them whenever I’m in town. They have a knack for choosing exemplary restaurants, and this year was no exception: we dined at Yakiniku Futago in the central district of Shimbashi. Yakiniku Futago is a small chain of yakiniku restaurants, and Shimbashi is their flagship branch, where the quality of meat and presentation aspire to another level. You enter through a dimly lit casual bar and pass a freezer housing assorted joints of meat, each labeled with the name of its owner, who can reserve a table and take another cut whenever they feel carnivorous. It’s a neat way of guaranteeing repeat business and is a widespread practice among Tokyo’s top meat restaurants. 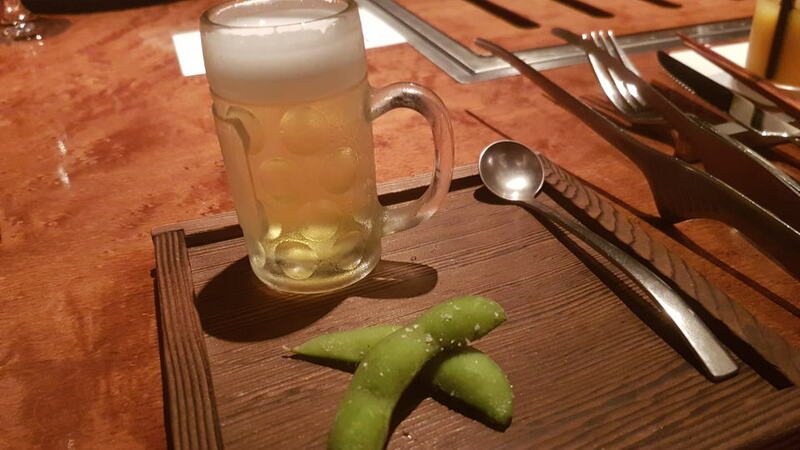 The standard was set with the first course, a miniature pint of beer and two salted edamame – except that the beer was in fact a cunningly disguised cool tomato jelly that you scooped out with a miniature spoon residing in a slide-out drawer under the table, along with other utensils that would be required later. It was a clever and fun way to begin. The second course arrived as a quartet of amuses bouches presented in a lacquered box. The pick of the ensemble was the sweet-pasted pumpkin with cream cheese and a stunning wagyu beef topped with yuzu ponzu and a blob of caviar. The third course was the first yakiniku dish, so we got the carbonized coals burning. (Readers who read my Vinous Table for Cobau should know all about that.) Called shioyaki (“salt-grilled”), this technique is usually applied to fish, but can extend to meat and poultry. Our servings included tongue, usually the thickest and requiring longer on the grill; Ibérico fatty pork; and a melt-in-your-mouth foie gras made from beef pancreas. The chef recommended yuzu gochujang sauce, but I found it overwhelmingly spicy and preferred a citric pineapple and lemon sauce that complemented the flavors more discreetly. Next we were each presented with a black lacquered box that upon opening revealed – cue drumroll – a scrunched-up ball of newspaper. That was a bit of a disappointment. But we unwrapped it to find a small square of wagyu beef sandwich that was utterly delicious. Two mouthfuls and it had disappeared. The fifth course took a break from the meat, offering a steamed egg pudding known as chawanmushi, its sweetness offset by a Moroccan sauce. The dish was quite homely and comforting, something you could imagine eating on a cold winter day. (Unfortunately, it was about 100°F/38°C outside.) This course could have served as a dessert, although here it gave the taste buds time to ready themselves for the main attractions. The tokusen beef came from a herd in the Aomori prefecture in the northern part of Honshu, Japan’s main island. Tokusen translates as “specially prized,” so we are talking A5 quality wagyu (again, see my future Vinous Table for Cobau). It arrived in a small treasure chest with liquid nitrogen pouring out over the table, the fog gradually clearing to reveal two slices of meat. All it needed was a “ta-da!” from the chef to complete the show. I made a mental note to instruct my wife to present all dishes this way at home. The meat had wonderful marbling. I flash-cooked mine for just 30 seconds on each side before dipping it in a saucer of yuzu ponzu sauce (and skipping the wasabi, as I find it overwhelms the purity of flavor and destroys any wine you might be drinking). The result was so delicious that I wanted to masticate in slow motion to prolong the gustatory experience. 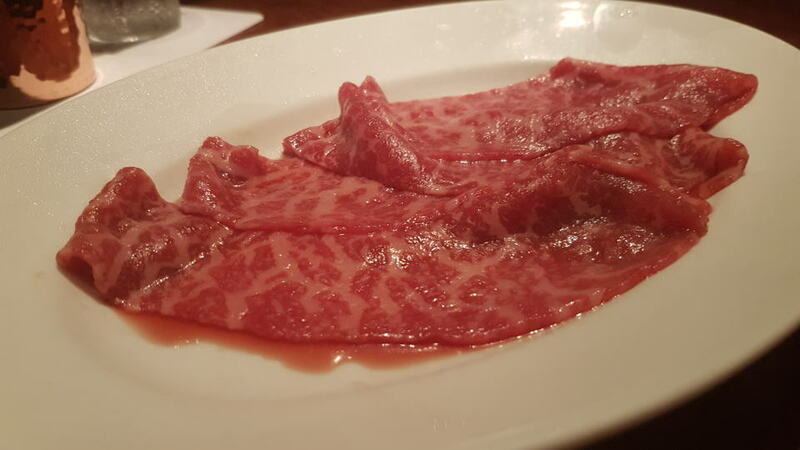 The final meat was the wagyu beef sukiyaki, the most heavily marbled of the meats. It was flash-grilled and then dipped in raw egg yolk. Imagine the tastiest thing you have ever eaten; it was like that, but even more delicious. Since we had no vegetable courses, we finished with somen (thin wheat noodles), served cold and delicately seasoned with Japanese plum, ginger and edible flowers. The somen cleansed the mouth and revivified the senses. Finally, we were each given a plate with one ball of vanilla ice cream, which seemed an underwhelming end to a spectacular dinner. Then out came a bleached dried branch along which perched four mascarpone and coffee mousses, frozen with liquid nitrogen. We were instructed to pull out our drawers and reach for a small metal hammer, bash the mousse to smithereens and mix it with the ice cream. This was another bit of interactive fun and a perfect way to finish a sensational meal. All that was left was a choice of eight infused teas, presented in test tubes so that we could nose each one and make our selection. We kept the wine modest and, incidentally, all served blind, commencing in the Alsace with a fine 2015 Barriques Pinot Gris from Domaine Ostertag. I must admit that the 10-month barrique aging misled me away from Alsace, but the wood is nicely assimilated. Ripe pears mingle with freshly sliced lemon on the voluminous palate, which still retains admirable elegance toward the simple, slightly honeyed finish. A delicious Pinot Gris, though not long-term. Next came the 2015 Chardonnay Estate from Talley Vineyards. I found much to like on the nose, where subtle tropical scents of guava and passion fruit slowly give way to more resinous aromas. The palate is very well focused, offering freshly sliced pineapple and Conference pear and gradually gaining depth with aeration, though I would have preferred a little more tension right on the finish. 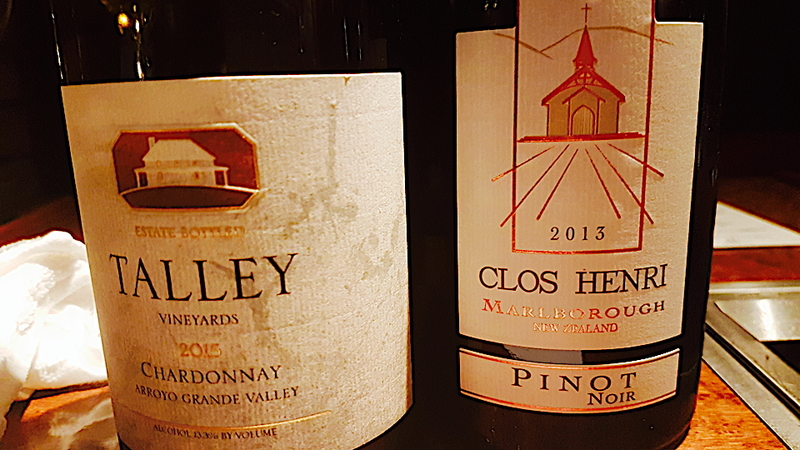 The 2013 Pinot Noir came from Clos Henri, the vines located in Marlborough. I could not quite get a hold of the nose, which lacked the immediacy I often find in New Zealand Pinot Noir; this one felt a touch aloof. The palate is better, delivering dusky red fruit, quite assertive tannin and lively red cherries and cranberry toward the low-key finish. 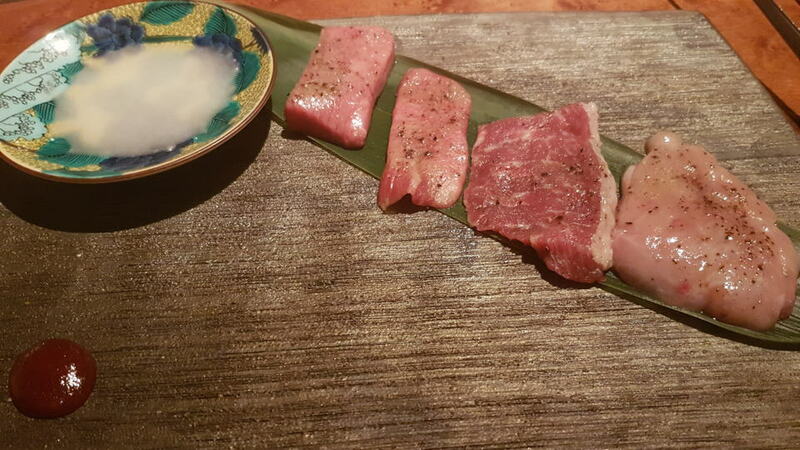 This was a fabulous yakiniku set meal that delivered everything you could wish for: mouthwatering meat from the finest wagyu, stunning presentation and a bit of theatre. 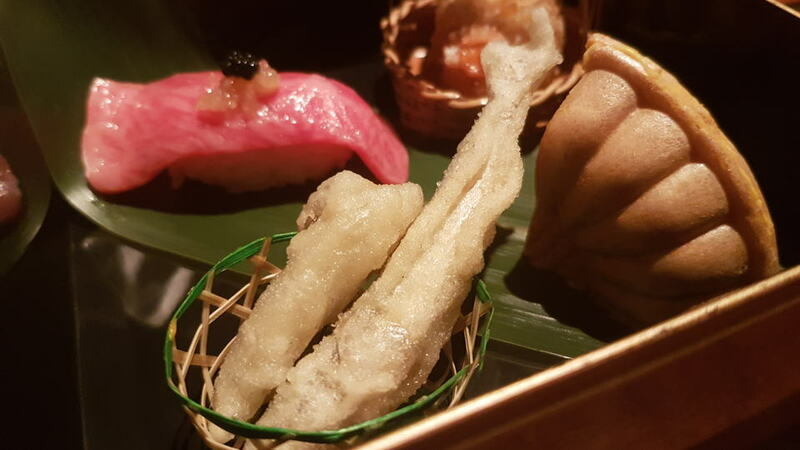 While the media tends to focus on celebrity sushi chefs, in fact many of Tokyo’s restaurants tend to be noisy and lively, but that does not preclude cuisine that is out of this world. I guess a restaurant like Yakiniku Futago doesn’t take itself too seriously – only the quality of the food. Thanking my former colleagues for their hospitality, I wondered how my life would have mapped out if they had not given me an interview and I had not bluffed my way into my first job in wine. I would not have been writing this, for a start.